In this post I want to focus on two publications that may have overturned a long-accepted archaeological narrative. Both papers re-examine evidence for claims of “association” between objects at the famous French sites of La Grotte du Renne (Arcy-sur-Cure, Yonne, France) and La Roche à Pierrot (St.-Césaire, Charente-Maritime, France), both of which have contributed greatly to perpetuating the idea that there once was an archaeological culture called the Châtelperronian. Critiques like Bar-Yosef and Bordes’s are disappointingly rare in the archaeological literature, and I want to use these papers to draw attention to a problem that I think is glossed over in most treatments of how we know what we know about the past. ‘Association’ is archaeology’s linchpin. Given its fundamental importance, how do erroneous inferences of association get into the archaeological literature, and why is it often years or decades before unwarranted claims are discovered or reported? I’ll propose some reasons for their rarity, and conclude that re-examinations of archaeological association should play a crucial, and not infrequent, role in furthering the goals of a scientific archaeology. In Archaeology, ‘association’ refers to the relationship between two or more objects that were involved in a discrete human activity, or a series of behaviorally related activities having a well-defined temporal and spatial beginning and an end. Purposeful burial and accompanying mortuary ritual are good examples. In general, it holds that if you get the associations right, then your conclusions can help to build an increasingly accurate view of how the human past unfolded; get it wrong, and future research based on your claim will become a fool’s errand until such time as your mistake is revealed. Examples of archaeological association. 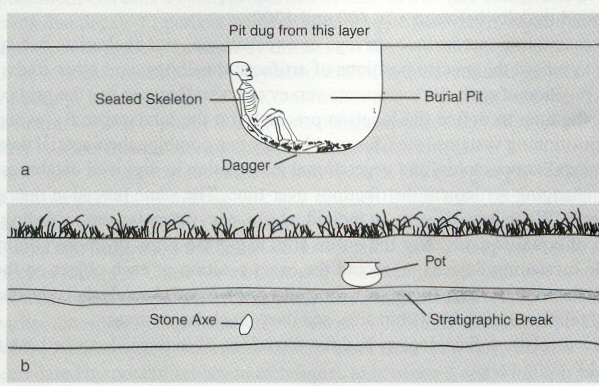 A.The skeleton and the artifacts in the burial pit are in association because all are found at the boundary between the purposefully excavated grave pit and the material placed on top. B. The pot and the stone axe are not in association because the context in which each was deposited is interrupted by the results of an unrelated event that is older than the pot and younger than the axe. Problems with association abound, and are the crux of my work on Neanderthal burial, of which I’ve spoken in an earlier post. I’ve previously written about the pollen and other plant traces that occurred near the remains of the Shanidar 4 individual, which are claimed to be “in association.” The excavator reports that he took sediment samples from “in the vicinity” of the remains. However, no attempt was made to delineate a context for the claim. In other words, there’s no evidence that the sediments comprising the samples were deposited at the same moment in time as the remains of the deceased Neanderthal. For this reason alone, nothing about these circumstances should compel a reasonable archaeologist to accept the claim. Yet, this ‘discovery’ has become orthodoxy in palaeoanthropology, and the Shanidar ‘flower burial’ is one of the reasons our understanding of Neanderthal capabilities is vexed with contradictions. 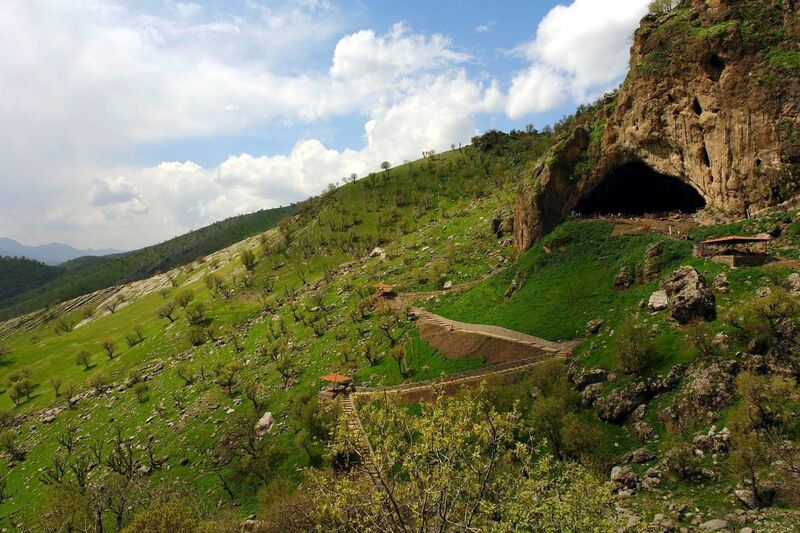 The Shanidar Neanderthals have been called everything from the first ‘flower children’ to the originators of burial of the dead. They’re even in the Guinness Book of World Records! 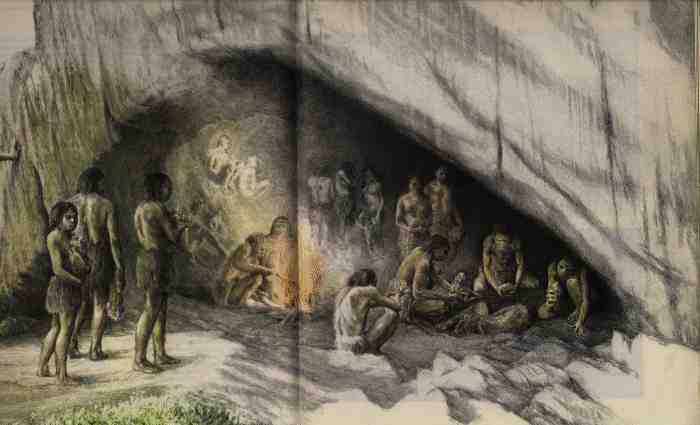 Depiction of the putative Neanderthal burial at Shanidar Cave (From: Origins, by Richard Leakey and Roger Lewin, 1977, pp 126-127). In the history of archaeology there are many other examples where erroneous claims of association have meant wrong turns made on the road to scientific understanding. The Piltdown Man hoax comes immediately to mind (although in that famous case the claim of association was bolstered by an outrageous prevarication on the part of someone that fooled human palaeontologists for a quarter century). In the 1970s Paola Villa laid to rest the notion that European Homo erectus was capable of building complex wooden structures by demonstrating that De Lumly’s claims for Terra Amata were based on erroneous inferences of association. 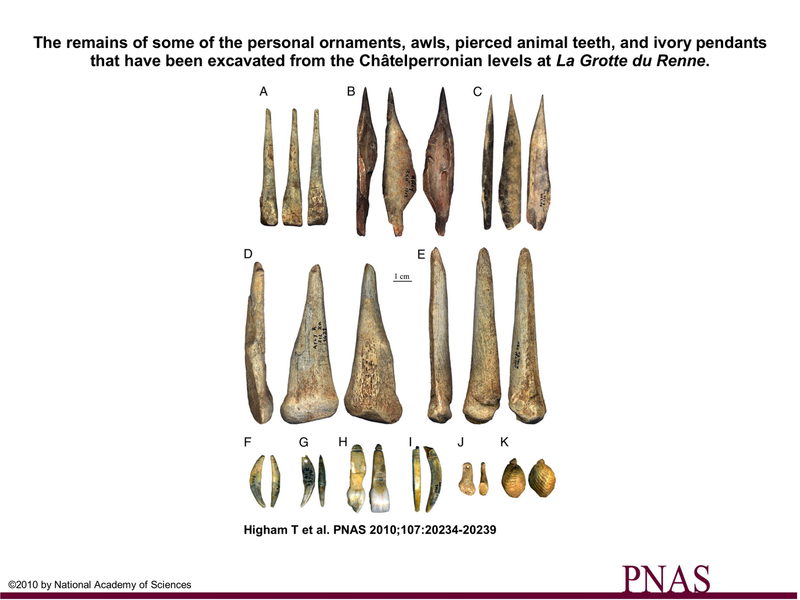 At La Grotte du Renne Leroi-Gourhan reported the “association” of Homo neanderthalensis remains with bone, antler and dental artifacts resembling those that most everywhere else in Europe are exclusively associated with the remains of Homo sapiens. A very influential archaeologist, Leroi-Gouhan’s observations reinforced the idea of a Châtelperronian industry, made by Neanderthals, which implied a high degree of cognitive ability, and suggested that they were trying to copy those items that they’d seen being made and used by Homo sapiens. These conclusions were widely accepted, and became entrenched as fact in the decades-long debate about the origins of modern humans. Bar-Yosef and Bordes focus on stratigraphy at La Grotte du Renne (Arcy-sur-Cure, Yonne, France) and at La Roche à Pierrot (St.-Césaire, Charente-Maritime, France), while Higham et al. provide new dating evidence from La Grotte du Renne. By exposing the shortcomings of earlier claims for the association, and thereby calling into question the inference of a unique set of Neanderthal behaviours, these two articles will finally force a reassignment of the Châtelperronian industry from the Middle Palaeolithic to the Upper Palaeolithic, and the authorship of these assemblages from the Neanderthals to the earliest modern humans in Europe. It also provides additional support for the ‘Replacement‘ hypothesis to explain the peopling of Europe and the fate of the Neanderthals. Despite their value, studies like those of Bar-Yosef and Bordes and Higham et al. are often met with apathy, or worse, antipathy, when they ought to be greeted with vigorous encouragement. To explain: for much of the last half century archaeologists have held that their discipline is an empirical science. Concurrently, there has been much internal debate about what, exactly, a scientific archaeology entails, and how knowledge of past events should be properly constructed. Archaeological knowledge of necessity relies on inductive (analogical) reasoning and involves constructing arguments that can be more, or less, cogent depending on whether or not the inferential linkages are well warranted. This would not be a problem if excavators were always correct. Even if the claimant is fallible, it’s still possible to “get it right.” However, one can also get it horribly wrong. Yet, despite the inherent danger of using someone else’s interpretations, in practice, and much of the time, archaeologists are forced to accept another’s conclusions, and are therefore in danger of constructing theories that are much like houses made of playing cards, outdoors, on a blustery day. For the most part such circumstances are forced upon us, because the danger of mistakenly inferring association is bound up in Archaeology’s bread-and-butter activity—excavation. In revealing its subject, excavation simultaneously destroys associations, by disrupting the physical relationships between and among items of interest—artifacts, firepits, detritus, animal remains, and so on. Once that’s done we must, at least provisionally, accept someone’s word for whatever occurred during the excavation. It might not be such a big problem if it weren’t that recognizing associations during excavation is by no means straightforward. Indeed, quite often archaeologists must infer association after the fact. In such cases, getting it right depends on choices made, prior to excavation, of which observations to record during excavation. Thus, the content and quality of records kept during an excavation becomes, crucially, the only ‘evidence’ of association once the excavation is over. Aside from those records, those of us not intimately acquainted with the circumstances of excavations are left either to accept or reject claims of association—we must trust the individual(s) who did the work and who are given the task of reporting on it. Because of Archaeology’s dependence on accurate and meaningful record keeping of observations made in the field and data generated in the laboratory, the volume of such records can be breathtaking. For, if it is sincere in its goals, and the questions it seeks to answer are sufficiently important, an archaeological excavation can easily take years and involve dozens of experts and investigators, to say nothing of the hard-working field assistants whose efforts are the bulwark of archaeological science. Such projects generate thousands of pages of notes, hundreds of hand-drawn illustrations, an enormous number of photographs, the artifacts themselves, plant and animal remains, and even the “dirt” in which the items are encased. For this reason alone it is inherently difficult for those who didn’t take part in the project to verify claims of association. And this underscores a fundamental difference between archaeology and some of the other scientific enterprises, such as physics or chemistry. In those fields the “repeatable experiment” is the cornerstone of knowledge. Anyone wishing to may verify a knowledge claim by following the instructions of those who undertook a given experiment, to see if they get the same result. One thing is for sure, archaeology is precluded from being a so-called ‘hard’ science because our “experiments” (i.e. the manual excavation of accumulated anthropogenic sediments) are non-repeatable. Because the archaeological “experiment” is unrepeatable, articles such as Bar-Yosef and Bordes’s and Higham et al.’s are crucial to the discipline, because they seek to scrutinize the path of reasoning taken by the original excavator(s), and to question the theoretical underpinnings of their inferences—in effect, repeating the unrepeatable. Yet, even though a theoretical repetition of the archaeological “experiment” is feasible, and by some considered a worthy undertaking, there are a number of institutional reasons why it is so rarely undertaken, and why archaeologists rely so heavily on the interpretations of other archaeologists (generally without recourse to the original observations from which their inferences were drawn). Mistaken claims of association have long bedeviled archaeology, and the story of the Châtelperronian is no exception. Unfortunately, matters are made worse by the culture of archaeologists, and the taboo against voicing criticism of a prominent archaeologist’s conclusions. To say the least, going back over the original records of a large archaeological project is a daunting prospect to anyone wishing to “check up” on the claims that excavators make. Thus, for a very practical reason archaeologists tend to accept, at least provisionally, the claims of association made by an excavator. However, there are other, more immediate reasons that an academic archaeologist is reluctant to retrace the steps of another archaeologist’s inferential process. It would be profoundly damaging to their career. That’s because there are no funding sources for such reappraisals, nor tenure committees that would value the enterprise as a first line of research (mostly because it would garner little in the way of extramural funds, which are of the utmost importance when it comes to institutional reputations). Besides, most archaeologists are quite happy to employ those authorities whose inferences support the argument they are making based on their own research of the moment (what Gary Haynes has called ‘closed quoting circles’). Thus only someone secure in their position (unconcerned by the career treadmill) could or would undertake such an examination. This, as much as anything, explains why re-examinations of previous findings are usually undertaken by students whose careers have yet to blossom, and who have not yet developed the self-preservation instincts of tenure-track academics. Nevertheless, such activities are capable of propelling nascent careers into the intellectual stratosphere by virtue of their “game-changing” implications. Sadly, few are bold enough (or naïve enough) to question the conclusions of a senior principal investigator (at least while that PI is still living, or still considered reliable by their peers). Politically driven caution prevails, even when, for example, there is a general suspicion that a long-accepted narrative is flawed. Adding to the peril is the risk of alienating archaeologists other than the PI, those whose interpretations and livelihoods will be threatened because they relied on the first PI’s interpretations to shore up their own arguments. As a result, those who presume to call into question the “standard story” are often dealt with harshly. This may be direct and in print. Usually, however, punishment is less overt, for example limiting access to collections, giving negative reviews on grant proposals, or whispering campaigns that can influence hiring or promotion. Either way, careers suffer. Critical examinations of archaeological interpretations are, sad to say, rare. If you’re familiar with my story, you can understand why I believe strongly that, rather than being frowned upon, or dismissed uncritically, such re-examinations should be celebrated as an example of the scientific rigor that’s possible in archaeology, despite its inherent epistemic limitations. ← There Is Only One Human Race. Part Two of "The Evolutionary Biology of Race: Are There Human Races?"